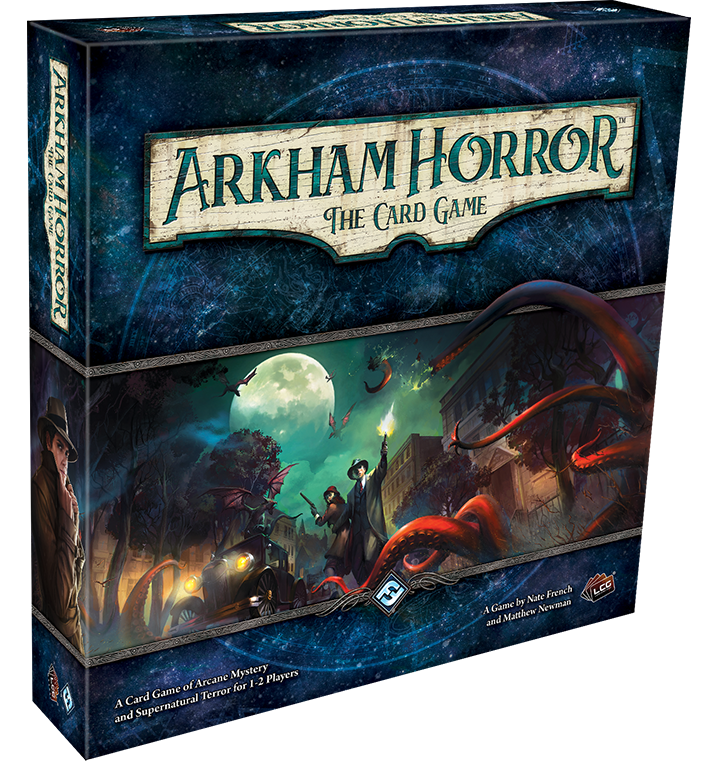 Arkham Horror: The Card Game is a cooperative living card game from Fantasy Flight Games for 1-2 players. As in most Lovecraftian games, the players are taking on the roles of investigators who are… well… investigating strange, horrifying happenings. The base game is a story that is played out over three scenarios. Because the story develops from one scenario to the next, I won’t be touching on plot points in my review. The scenarios are set up so that there are goals that the investigators are trying to accomplish. These goals are mostly accomplished by investigating locations for clues and then using those clues to advance the story to get a new goal. This deck is called the “act” deck. On the flip side, there is another, more sinister deck: the agenda deck. This is what the forces of evil are advancing. At the beginning of each round (except the first round) a doom token is placed on the agenda deck. When it hits the required number of doom, that deck advances, and normally that means that something bad happens. So the investigators are racing against time to try to advance their act deck, while the monsters and minions are inexorably advancing their own agenda deck. Besides putting doom on the agenda deck at the beginning of the round, each investigator will also need to draw a card from the encounter deck. These cards are uniformly bad stuff that happens to you. You might draw a monster that will go into play or a card that might make you test one of your abilities. If you fail that test, you may take some damage. The scenario deck, which includes the locations, encounter deck, agenda and act decks, is custom built for each scenario, so that it is thematic with what is happening in the story, which is pretty cool. Another cool thing about Arkham Horror: The Card Game is that you don’t have to “win” each scenario in order to continue. You will often have the option to simply run away. This affects the next scenario, but doesn’t stop you from continuing to play. You can also partially succeed before moving on to the next scenario. 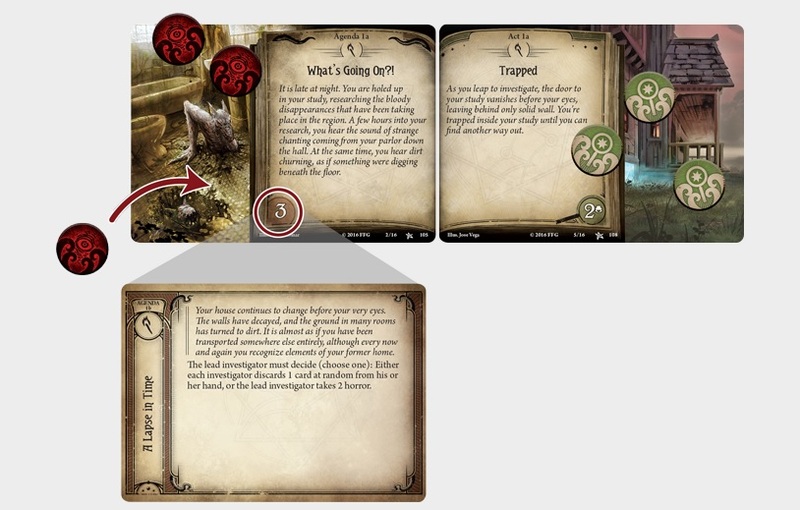 So each turn the investigators each have three actions. The main actions available to investigators are move, investigate a location (aka get clues), fight, evade, play a card/draw a card, or get a resource. Each investigator has their own deck of cards with lots of helpful stuff like cards that improve your stats, weapons cards, spells, etc. Because each player only gets to perform three actions, it can be very tough to decide which actions are the best to do each turn. For instance, there are times when you might have three amazing cards to play that would really help you out. But you’ve only got three actions. Do you really have the time to waste to play all three cards in one turn? The other catch is that many of your cards will actually cost you resources to play. So even if you wanted to play all three cards on the same turn, you may simply lack the resources to do so. Another note about your player deck: the decks also have weakness cards as well. When you draw those cards, they mess you up. They could simply be an enemy that immediately starts fighting you. Or they could be a lingering effect that makes you worse at checks until you spend the requisite amount of actions or resources to get rid of the card. I’ve been talking a bit about skill checks, so let me go into that for a moment. Each investigator has four statistics: willpower, intellect, combat and agility. When you want to fight an enemy, you test your combat stat. When you want to investigate a location to try to pick up clues, you test your intellect statistic. Sounds straightforward, right? Well, in Arkham Horror: The Card Game, there’s a complication. Every time you have to make a check, you have to draw a token from the chaos bag. Many of the tokens are straight to the point. They have numerical values that either add or subtract to your skill test value. If the negative value makes you fall below the required number, you fail that test. There will also be other tokens in the bag that have symbols on them. The meaning of those symbols will change from scenario to scenario. The awesome thing about the chaos bag versus rolling a die to affect the skill checks is that you can build the bag to be easier or harder depending on how you’d like to play. 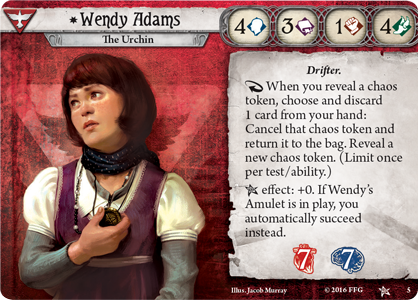 Arkham Horror: The Card Game has specific bag configurations to make the game easier or harder, which is pretty amazing. It gives the game a lot more variability than just rolling a die. 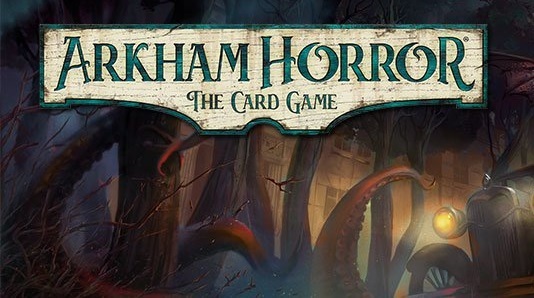 I definitely enjoyed Arkham Horror: The Card Game. There are a few more fine points to the rules involving the player deck, monsters, etc. But in general the game isn’t that hard to learn. The flavor and story of the game is pretty fabulous. 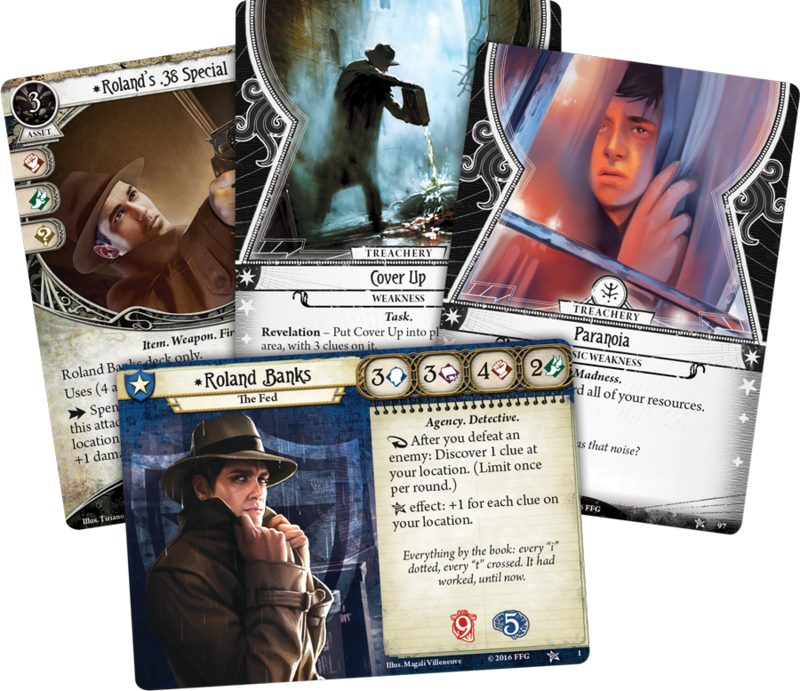 Each investigator’s deck is unique, with their own types of cards that make sense with their back story. The monsters and locations also mesh well with the story that is being told in each scenario, so it never felt like I was just playing the same game over and over again. The game is really hard, which is great. I always felt like I was never completely prepared to face whatever situation we were in, thanks in part because I could only do three actions per turn. The limited amount of actions really made it hard for us to succeed, and made us think carefully about what our “best” moves might be. Of course, even if we had a great plan, it was often wrecked by the chaos bag. Those -4 tokens are really harsh! This feeling of struggle and always being one step behind is really thematic to the whole Lovecraftian universe. The game did a great job with the theme and the story, which I really appreciate. Each scenario is about 1-2 hours, though it might be shorter if you lose quickly. The game comes with four different investigators, and who you play with makes a big difference. In our first scenario we went with the recommended starting characters and decks and we lost quickly. We decided to redo the whole thing with the two other characters, and had a lot more luck. The fact that the game includes four characters also gives it a bit more replay value. I’m interested in playing the whole campaign again with the recommended two characters. Your characters also get experience and can customize their deck over the course of the game, which again can add a bit more replay value to the game. If you replay all the scenarios, you will know the major plot points of the stories, but the cards and tokens you draw will be different. What you draw from your deck, the scenario deck, and the chaos bag will hugely affect how well each scenario goes for you. The one thing about the game that I wasn’t the biggest fan of is that I was just starting to feel like I had gotten the hang of everything when we were playing the final scenario. Once we had played the intro and the second scenario, I felt like I had a good grip of what my options were and had built my deck the way I wanted it to look. By the time I felt like I was pretty in control of my character, we were on the final scenario. And by that time, we’d already made a mess of the second scenario, so our chances of winning the final scenario were pretty slim. This is part of the reason I want to play the game again, because I know that I could (probably) do so much better now that I am fully aware of the way the game works. I would like to actually succeed, or succeed more fully at the scenarios on the second time around. Though the fact that I want to play it over again, probably speaks to the fact that I really enjoyed playing the game. Arkham Horror: The Card game is fun, fast and terribly hard to win. The story comes shining through the entire time, and the way they randomize each scenario, both through the scenario deck and through the chaos bag is fabulous. I heartily recommend Arkham Horror: The Card Game. It is for 1-2 players, each scenario takes about 1-2 hours, and it costs $39.95. If you want to play with 3-4 players, you will need to buy two copies of the game. 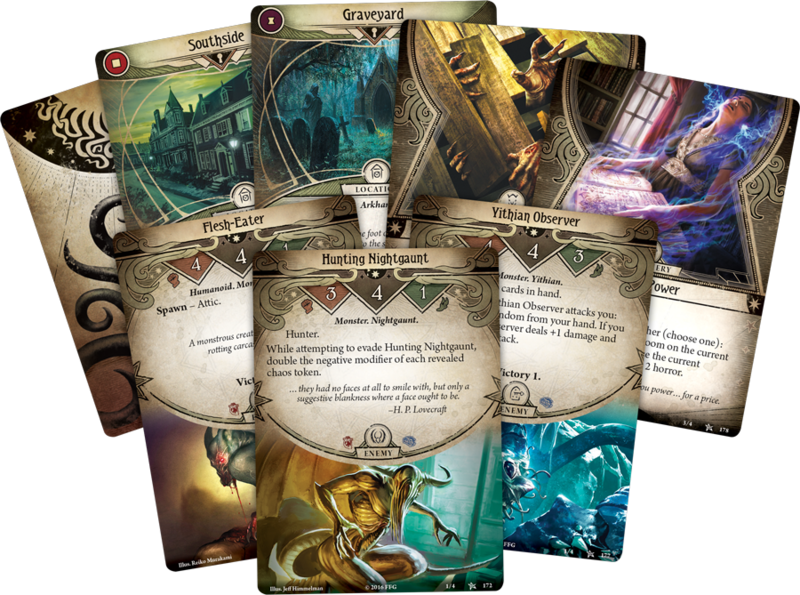 Arkham Horror: The Card Game also already has an expansions out called The Dunwich Legacy. You will need to own the base game to play this expansion, and it adds two scenarios and five new investigators. There are also several standalone adventures that you can grab once you have the base game.